The Archive of Norwegian Landscape Architecture represents significant values for the disciplines, for design processes and for society in general. Recently, I listened to a conversation between a profiled landscape architect from Norway and some students from the School of Landscape Architecture (ILA) at NMBU. The students were telling the practitioner that the lectures in the seminar about garden history and conservation were difficult to follow. Historical sites are complex and a challenging topic especially when it comes to management issues. The answer from the landscape architect was that this is a peripheral topic and should not bother the students too much. Apart from the fact that the answer was not pedagogical, it raises the question: what is the value of historical studies to practitioners, and what role does an archive play in it? This post is an attempt to answer this question, and hopefully to be able to broaden the awareness of historical studies and the importance of such thematic archives. Another reason for writing this post is, in contrast to many other archives, the archive of landscape architecture contains mainly “visual culture”, such as drawings, maps, plans, projects and photos. How to categorise and register them is one challenge (which is another topic that deserves attention, so it is not discussed in this post); and how to understand their values for academics, practitioners and society in general is another challenge. I will argue that the archive of Norwegian Landscape Architecture is relevant not only to the design traditions in Norway, but also to the discipline of landscape architecture as a whole, as well as to the Norwegian society in general. Clock building 2014, Norwegian University of Life Sciences (NMBU). The Landscape architecture education has been performed at NMBU for almost 100 years. Photo: NMBU, Gisle Bjørneby. For the understanding of a discipline, historical research plays a central role. This is also the case in landscape architecture in Norway. At NMBU, the Landscape architecture academic education has been performed at one single institution for almost 100 years. It is therefore interesting to trace this history through the archives preserved here. John Dixon Hunt states that landscape architecture lacks “serious or sustained interest in the history and theory of its field” (Hunt 2000). The problem is that most contributions to the history of landscape architecture are conducted by historians of architecture, art and other adjacent disciplines. Those disciplines see the gardens and parks as an interesting but rather marginal element (Hunt 2000). Studying the discipline’s own history does not mean that the landscape architect has to be a “qualified historian”, although it is one way to understand “the conceptual principles of a profession” (Hunt 2000). In a creative discipline as landscape architecture, one refers often to projects as visual works. The role of illustrations in design process is important as a background for theory and abstraction. In contrast to other artistic disciplines, where the object, the architecture or painting, is more or less finished when accomplished, landscape architecture uses living material that is subject to temporal changes. Therefore, archives are important to understand former stages of the project, as well as the initial plans and ideas (Hopstock & Schönwälder 2013). In landscape architecture offices, there is often too little room for reflection on how a design or a project is located in history. It is hoped that this archive encourages practitioners to get in touch with the history of their own discipline. 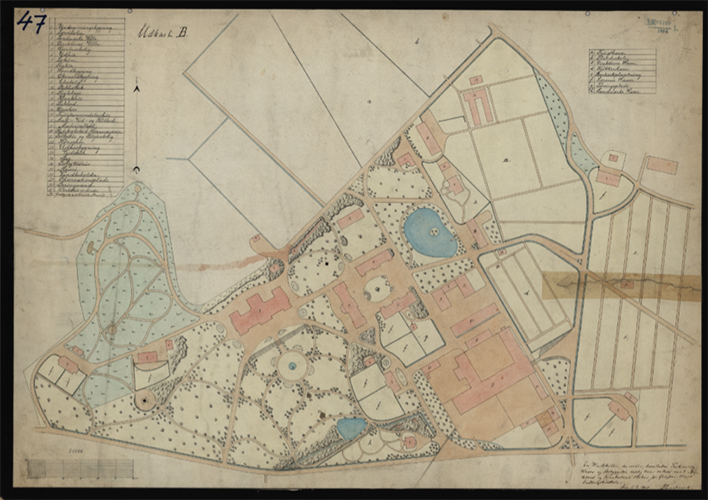 The archive contains plans and proposals to the first development of the Norwegian Agricultural College (now NMBU) in 1859 and onwards. It covers the major works: the buildings and the park including all outdoor eductional and research facilities. Map by Landmark from 1900. Gardens and parks are not only objects to be designed and built, but also “ideas for larger enterprises”. The historical context is part of the conceptual understanding of landscape architecture as a whole (Hunt 2000). Places tell stories and no place lacks history. “Particular history has to be involved in the remaking of that place” (Hunt 2000). It is the landscape architect who translates those stories into a new design. By neglecting the historical context, the landscape architect misses the unique assets of the place. Place making is anchored locally. However, globalization of landscape architecture has been working against this tradition. On the one hand, “famous landscape architects are called to work anywhere in the world, without ever being allowed (it seems) adequate time to grasp the full implications of the locality where their firm is currently engaged” (Hunt 2000). On the other hand, when their projects are built, crowds of students and professionals visit the sites and bring the ideas back into their own works regardless different local contexts. This copy-paste interpretation of an international vocabulary often detaches the place from its own (historical) context. The landscape architect should mediate the relationship between the past and the present. This can be done by documenting the historical development of the place. It also includes “the observation, collection and interpretation of the visual and verbal response to a garden, park or landscape”. Here historical documents are especially valuable since they give an insight into a continuous perception. With those accounts, one gets a comprehensive picture of the evolution of the place through time (Hunt 2004). The collections of Norwegian Landscape Architecture show the initial project ideas, the design processes and the realization processes of the ideas. Gardens, Parks or spaces in towns and urban areas start with an idea and, through the uses and added functions, they are part of daily life and jointly compose a dynamic environment. Even if the designer or creator is forgotten, the project remains (Wolf 2012). Maps, photographs and written documents show design and the realization processes of the ideas. Photo of the central park in progress in front of the Clock building around 1930. The archive contains not only elite gardens but also public parks, urban spaces and vernacular gardens. It is significant for the society for at least two reasons. On the one hand, The National Protection Plan in Norway (Landsverneplan) has a list of valuable gardens and designed landscapes that represent Norway as a nation. However, these gardens and designed landscapes are protected and managed under different protection plans by different sectors. 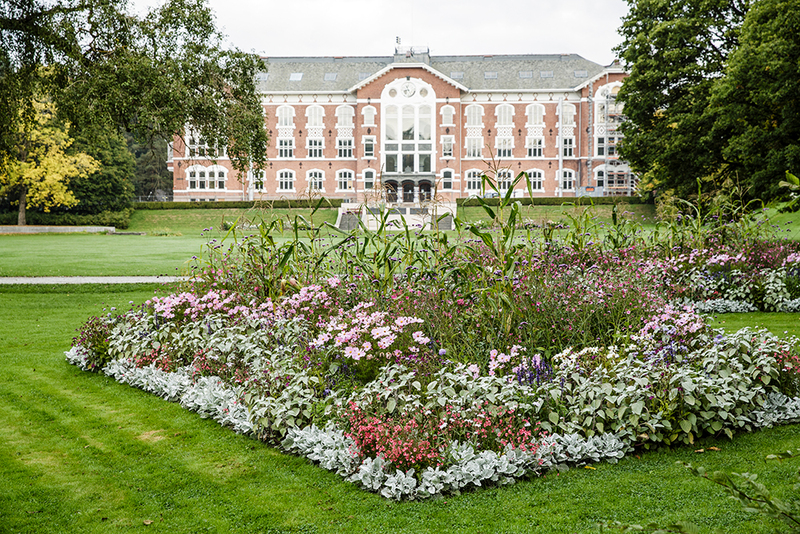 For instance, hospital parks are under the care of health sector, and educational parks (such as the NMBU campus in Ås) are under the care of educational sector. 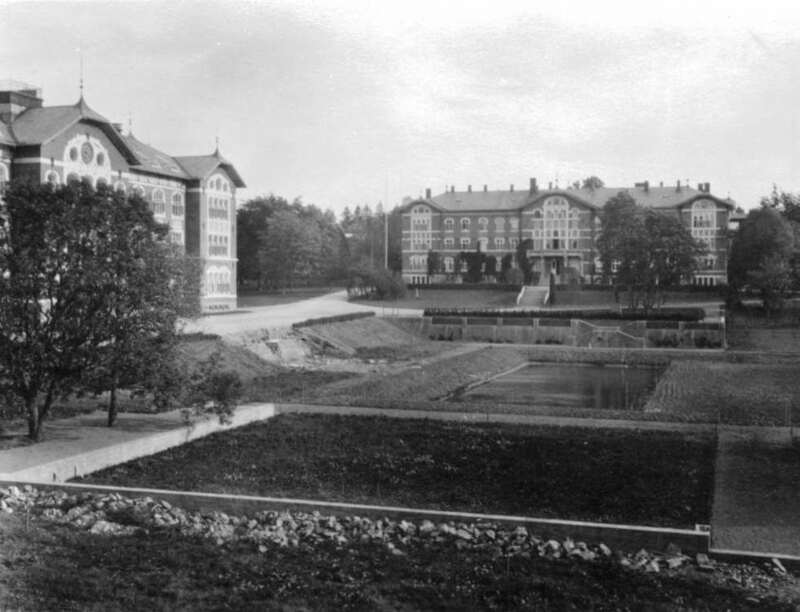 In the Archive of Norwegian Landscape Architecture, instead, one can find first-hand sources to different kinds of projects, including some gardens, parks and designed landscapes preserved by the National Protection Plan in Norway. On the other hand, there are many parks, gardens and public spaces that are not preserved by law but contain important values for the region or the local people. They are part of the everyday-landscape and materials for local people’s identity building. The values of these everyday-landscapes have been growing and developing over time, partly through use, and have become part of a tradition. They might be even more important for future generations. Archives play an important role in this identity building, both individually and collectively. The societal foundation for identity (and justice) is the collective memory (Feng 2017). Landscape architects need to understand these relationships and links. Gardens, parks and designed landscapes in general mirror developments in the society. The archive is like a memory storage, it keeps societal, cultural and artistic currents. Without memories, we are detached from space and time. Memories are our connection between the present and the past. Memories are especially linked to places: private places or places of collective memories. Tied to objects, memories can be kept and reinterpreted over and over again (Wolf 2012). If landscape architects can incorporate historical contexts into new designs, the societal memory and the continuity of a place can be better secured. This is especially meaningful to the everyday landscape, which has a strong impact on our wellbeing, our collective memory and our identity. Feng, Huiling: Identity and archives: return and expansion of the social value of archives. In: Archival Sciences 2/2017, p. 97-112. Hopstock, Lars and Schönwälder, Kristina: Gedächtnis einer akademischen Disziplin. In: Stadt und Grün, 2/2013, p. 34-39. Hunt, John Dixon. The Afterlife of Gardens University of Pennsylvania Press, 2004. Copyright © 2019 Historical Archive of Norwegian Landscape Architecture. Powered by WordPress and Stargazer.